I’ve never actually met Sir Patrick Stewart, but this is totally how I think it would be. I guess the strangest place to meet the guy would be in the urinals of a public restroom. I started thinking about how would such a meeting go, and the script basically wrote itself. If this meeting was real, I would probably also ask him about the secrets of his eternal youth. The puns and dad jokes part? Well, it looks to me like something that fits Sir Pat’s personality, but who am I to say? Going back to eternal youth part, there are plenty of Internet jokes about how Pat Stewart never ages. He looks young, almost exactly the same as he did 30 years ago on Star Trek TNG. Some say he’s immortal, probably a vampire. This puts him in a distinguished position alongside actors such as Sean Connery, Neil Patrick Harris, and of course, the original vampire, Nicholas Cage. Vampire or not, I admit Sir Patrick Stewart is one of my favorite actors. I could attribute this fact to several reason. First, he stars in some of my favorite Sci-Fi, Fantasy and Historical movies and TV shows, such as “Star Trek”, “I Claudius” and “X-Men”. Second – his physical attributes: the mixture of his British accent, deep voice and charming looks. Third, his acting skills and his Shakespearean background. And last but not least, his immortality. I don’t mean him being an actual vampire, I mean that while the careers of some actors dwindle as they age, Patrick Stewart continues to be relevant, is vibrant as always, and continues to reinvent himself. In the mood for some more cartoons? 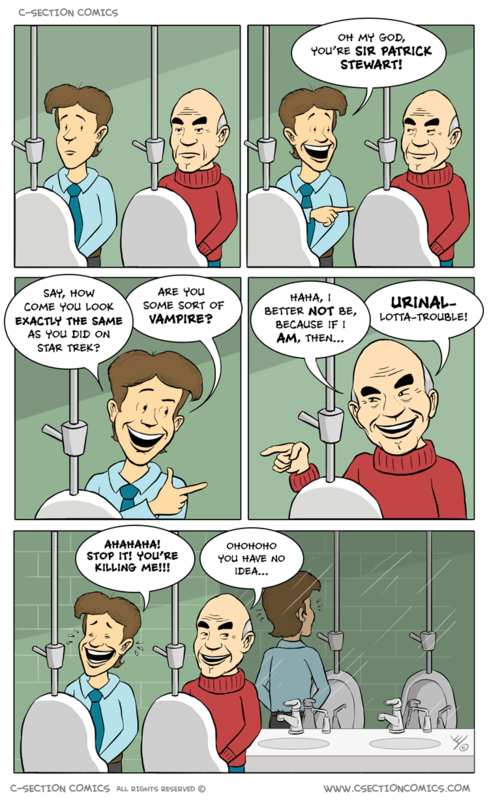 Here’s one about the 12 types of people you can find in urinals (Patrick Stewart excluded), and here’s a list of all our Star Trek cartoons. Dothraki vs Klingons – why are they so similar? The Klingon race was introduced in the original Star Trek series (TOS) during the 1960’s but since then their appearance changed significantly. The initial inspiration for them was Japan of World War 2, and indeed at first Klingons had a certain “Asian” look to them, with slightly slanted eyes and bronze skin. Later in the series, the inspiration for the “evil empire” changed from Japan to Russia, in the spirit of the cold war. In the Star-Trek movies of the 1980’s the Klingons went through a makeover, and got the appearance they have until today: big, muscular, usually bearded, with long hair and a ridged forehead. While the reason for the appearance change was primarily budget related (the 1960’s series didn’t have enough budget for make-up), fans and material such as the Star Trek Role-Playing Game provided plot-related explanations to this obvious appearance change. E.g. they claimed there are different races of Klingons. When looking at Klingon culture, it is depicted as a somewhat barbaric warrior culture, similar to the warrior nations we know in our own history: violent, clan-based, idolizing strength, with its own honor-based system. The Dothraki are the fictional creation of author George RR Martin. They were created as part of the universe described in “A Song of Ice and Fire” novels, which was later adapted to the television series “Game of Thrones”. The Dothraki are inspired by the nomadic horse tribesmen of central Asia, namely medieval Mongols and the early Turks. Even their leaders are called “Khals”, similar to the Mongol title “Khan”. They are described as barbaric, militaristic, extremely violent, yet also with their own code of honor. So as we see, both Dothraki and Klingons are based on the militaristic empires of Earth. Both races are considered as “Others” in their respective universes. On one side they are the enemy everyone loves to hate, because of their barbaric tendencies and their inherent violent nature. Maybe this is also the reason why in both TV shows, they made Dothraki and Klingons speak in their own guttural language instead of “English” – with the purpose of further alienating them. On the other hand, especially as the plot advances, you learn to relate to at least several members of those races. On Star Trek The Next Generation, Worf, a Klingon, becomes one of the main protagonists (and he’s undoubtedly one of the most beloved characters in STTNG). In “Game of Thrones”, there’s a slight shift in the way we view Dothraki. In my opinion, it’s best reflected in the shift of our view of Khal Drogo: from the initial contempt following his literal purchase of Daenerys Targaryen as a brides. In any case, when it comes to measuring Dothraki vs Klingons in terms of popularity, both races are equally popular among their series’ respective fans. After all, everyone likes barbarians (as long as they’re far enough, and nothing’s farther than a different, fictional universe). Even their languages, Klingon (“Klingonese”) and Dothraki, are considered popular languages among geeks such as myself. In fact, geeks speaking Klingone has become a kind of a trope, but let’s leave that topic to a different cartoon (stay tuned). So, “Valar morghūlis, mirre cartoons ēdruta sagon pikībagon!” – That’s High Valyrian for “All men must die, all cartoons must be read!(*)” . In that spirit, here are some additional Game of Thrones cartoons, like the one asking what if Meme stars were cast for Game of Thrones? or the one about how FRIENDS are viler than Lannisters?. And here’s the complete list of our Game of Thrones cartoons (including the one above). (*) Translated via the High Valyrian translator. Go check it out! 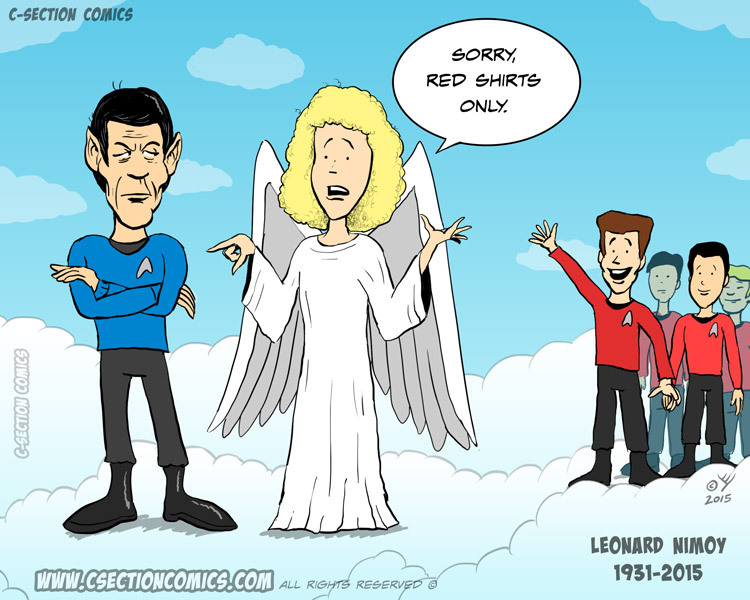 Leonard Nimoy, best known for playing Mr. Spock on the original Star Trek series, died a few hours ago.